A recent comment prompted me to revisit Nicholas' Memorial Video. These images are forever etched in my mind, my heart and my soul. It is both heart-wrenching and comforting to watch. The story of our lives.... bittersweet contradiction. There is such a fine line between genuinely caring what others think of you and not caring at all. I have always been so conscious of doing right by others. I don't like to let anyone down. I like to give my all. Since losing Nicholas I must admit that some of these sentiments have changed. I'm not afraid to cut someone from my life to protect my heart and that of my family. I'm more apt to ignore certain people once my feelings are hurt. I'm definitely not as willing to compromise where disrespectful behaviour is concerned. If you burn me once, you're not worth my time or my sincerity. Seems so harsh, but true. The love and friendship I have in my heart is precious to me. I think I have a lot to give, but I feel one must earn it, one must appreciate it. So, this all leads to the question..."why does it hurt so much when a so called friend/family member seemingly intentionally does something/says something so hurtful?" I know I should just blow it off. Not let the trivial things upset me... but, dammit, it hurts! Thank you to Franchesca at Small Bird Studios for organizing this blog hop! 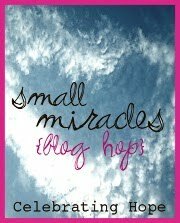 I just love the title of these blog hops ~ Small Miracles. Simple, pure, clean. Focusing on the little things means so much to me. Much more than it used to. I have always been a believer. A believer that the path we are given in life is the one we are supposed to take. That the miracles and blessings that surround us along the way are special and we should hold each one very close. Since losing Nicholas my belief has been shaky... My faith has been tested time and time again and yet, my heart still believes. I believe in happy endings even through the pain. I believe in healing hearts and butterfly kisses. I believe in the sunshine and the warmth it lends my soul. I believe in my children's laughter and that things will be okay. I believe in the strength of my husband's embrace. I believe in the power of our family's love. I believe in sweet, baby Angels and the inspiration they embody me with. I believe in small miracles. Today, I am deeply saddened. Today, I can't see through the tears. Today, my heart and my soul ache. Today, I learned of another Angel born far too soon. Today, I sit here in shock for a dear friend who is now forced to live with one of the most difficult journey's a parent must face. Today, I grieve for a precious, little life that didn't have a chance. Today, I am sickened to know and understand what devastating pain my friend and her family are feeling. 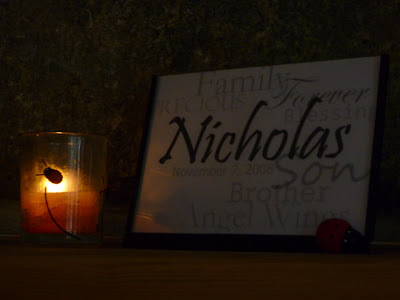 Today, I miss Nicholas. Today, I miss what could have been... what should have been. Today, I am heartbroken for a friend, a mother. Today, I will honour her baby boy. I will remember him. I will pray for him. Tonight, Nicholas' candle is lit for baby Jacob. "I have never been a religious person, however, I have always had a strong sense that Guardian Angels surround us.... how bittersweet that you got to meet yours."